Preheat the oven to 400°. Halve the squash lengthwise and remove the seeds. Place the squash, cut side up, in a baking pan. Season with 1/2 teaspoon each of the salt and pepper and cover tightly with foil. Bake for about 1 hour, until the squash are tender but not mushy. Let cool slightly. Meanwhile, in a medium saucepan, combine the leek, olive oil and 2 teaspoons of water. Cover and cook over moderately low heat until the leek is soft and translucent, about 5 minutes. Uncover and stir in the wine. Increase the heat to high and boil until the liquid is reduced to approximately 3 tablespoons, about 3 minutes. Stir in the stock, milk, sugar and remaining 1/4 teaspoon each salt and pepper. Remove from the heat. Using a big spoon, scoop the flesh from the squash in large pieces. Place in a medium bowl. To assemble the gratin, preheat the oven to 400°. Bring the leek mixture to a boil. Spoon half of the squash into a 6- to 8-cup casserole. Ladle half of the leek mixture over the top and cover with half of the toast and half of the Gruyère. Repeat the layers with the remaining squash, leek mixture, toast and Gruyère. Sprinkle the Parmesan cheese over the top. 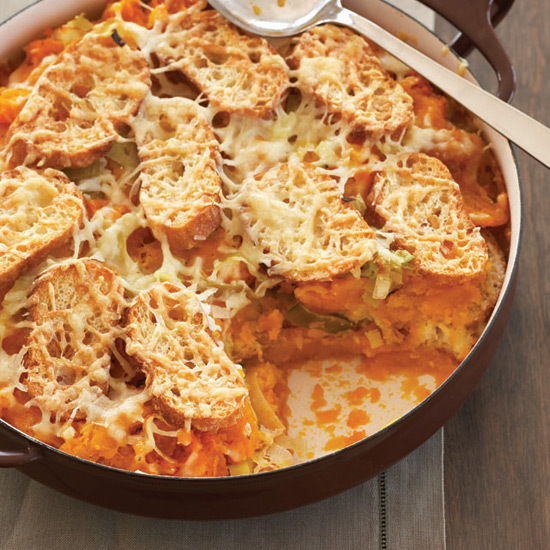 Bake the gratin for 30 minutes, or until the top is browned and bubbly. Garnish with the basil and serve. The recipe can be prepared through Step Three up to 3 hours ahead. Set aside at room temperature.